Children are active. They run a gauntlet of activities that would paralyze the average adult with fear. They are young and their eyes will be exposed to harmful effects for a much longer time. Their eyes must be protected! Child’s play? 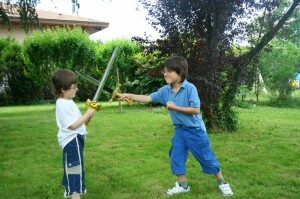 Looks a little dangerous, let Parrelli Optical® protect your child’s precious sight. There are new, highly impact resistant lens materials that protect your child’s precious sight while providing exceptional visual clarity. These designs offer extra scratch resistance to stand up to the demands of your child’s active lifestyle. We also have new materials that offer protection from the burning rays of the sun’s ultraviolet light and the destructive accumulated exposure to blue light exposure. Kid’s eyes have very large pupils. Young eyes are also clear, allowing light to pass through the cornea, into the lens and then on to the retina. Your child’s sharpest vision is provided when incoming light is focused on the most sensitive part of the retina, a spot called the macula. Sources of harsh blue light are the sun, modern indoor energy efficient lighting, smart phones, computers, tablets, any digital device even your television. Designers of these gadgets intentionally increase the amount of blue light they emit to brighten their screens. The complicating problem is that young people spend on average four times as much time outside in direct sunlight as the average adult. Those same kids often spend more than 7.5 hours every day on a computer (think classroom time) and phone, tablet or television. The shorter their arms, the closer these devices are held to their eyes, increasing the amount of blue light reaching the retina four times. And of course they are young, adding many more years of exposure to blue light emitting digital contraptions as their parents ever did. This high energy blue light destroys the nutritional network that supports the retina and over time leads to macular degeneration, an irreversible loss of central vision. This same blue light disrupts your child’s circadian rhythm, disrupting sleep patterns which can lead to behavioral and general health concerns. Most of us could never survive the hazards that our children encounter every day. Sometimes eyeglass lenses for children get scratched, or eyeglass frames for children get broken. You can purchase glasses for children with the confidence that Parrelli Optical stands behind every pair with our “You Must Be Totally Satisfied” written guaranty. Frames hold lenses and lenses allow your children to see well. The correct prescription is only part of the story. The alignment of the lens in front of eye is also critical to seeing the world clearly. 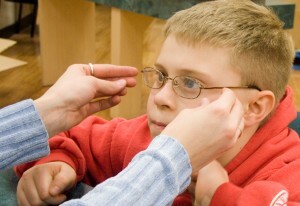 Glasses for children should be fit properly when they are first dispensed. Due to their active lifestyles eyeglasses for children should also be re-adjusted regular to assure their proper vision correction. We offer unsurpassed professional care for your child. All children need back up spectacles. All children need Sports Eyegear Many children also get contact lenses. Knowing all this, the children’s eyewear specialists at Parrelli Optical® have created frame and lens dress eyewear, sports eyegear and spare pair packages priced at tremendous savings to you. We want to care for your children’s eyes because we are professionals dedicated to providing the best eyecare possible, to all of our clients. We have been in business for more than 40 years. And, quite honestly, 40 years from now we want to care for your grandchildren’s eyes. We will work very hard to earn and to keep your trust and confidence. You can trust the experienced professionals at Parrelli Optical® to care for your children’s sight.